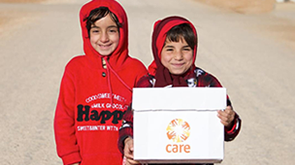 Read this letter to CARE supporters from Laurie Lee, Chief Executive of CARE International UK, about why aid is so important, what it achieves, and why the changes that Boris Johnson, Priti Patel and the so-called TaxPayers' Alliance want to make to how much the UK spends on aid, and what we spend it on, aren’t just wrong – they simply won’t work. fight to keep the aid budget focused on helping the world's poorest people. Find out who your MP is and get their contact details (including email address) at www.parliament.uk. What difference does aid make? It would be difficult to convince the more-than-one-billion people who have now escaped extreme poverty that ‘nothing has changed’. For example, thanks to UK aid, over the past four years 11 million children have been able to go to school for the first time. More than 62 million people now have access to clean water, better sanitation or improved hygiene conditions. And millions of people have started to earn a living through small businesses and farming projects assisted by UK aid. It’s a simple fact: UK aid is making a difference to the lives of the world’s poorest people. If aid is working, why do we need to keep giving it? Likewise, it would be difficult to convince the 1.2 billion people around the world who still live on less than £1 a day that no more needs to be done. A lot has been achieved: for example, in the past decade, the number of children dying before their fifth birthday has almost halved. But what about the other half? There’s still a lot that needs to be done. Doesn’t aid money just end up in the pockets of corrupt people? UK aid programmes are among the most transparent in the world: we are ranked as 4th out of 46 national donor organisations in the global Aid Transparency Index. So the UK is making sure that taxpayers’ money is spent where it’s meant to be spent: on reducing poverty for the world’s poorest people. What’s more, UK aid is also actively helping to fight challenges such as corruption in countries around the world, by supporting ordinary people living in the poorest countries to hold their governments to account for how they spend money. What’s so magical about 0.7%? The 0.7% figure is not an arbitrary number; it is an internationally agreed amount, based on UN calculations of the amounts needed for poor countries to successfully develop, which the UK and other countries committed to over 45 years ago. The UK government commits other spending in line with similar international targets, such as the 2% of GDP spent on defence as agreed within NATO. Why do we need a law? Public support over the years has led to cross-party consensus that meeting the 0.7% commitment is both the right thing to do, as well as being in our national interest. Aid can boost economic growth and political stability around the world – and it is surely in our own national interest to live in a more peaceful, stable and prosperous world. Parliament agreed in 2015 to make 0.7% legally binding to ensure that the UK’s long-term commitment to tackling global poverty could not be undermined by short-term political changes or local political events. And it makes good business sense too. The predictability of aid to poor countries helps doctors, nurses, teachers and other providers of services in those countries to plan their work better, and means that our government can make smarter long-term investments in aid programmes. Why should we give more than other rich countries? UK aid policy reflects the view of the majority of UK citizens. The British are a generous people, even in hard times committing to local, national and international charities. Each year, the UK public donates millions to Comic Relief (£82 million in 2017) and whenever a disaster strikes, the British people are incredibly generous with their response. The UK isn’t the only country to give 0.7% in aid, but it is true that we are the first country in the G7 to do so. But surely this is something to be proud of. The President of the World Bank said that the UK’s commitment to development raised the estimation of the UK in the eyes of the developing world. We are justly recognised as a leader in international development – a country that keeps its word and follows through on its promises. Why must we give so much overseas aid when people are living in poverty at home? 7p in every 10 pounds – is it really so much? As a proportion of government spending, the amount we spend on aid is dwarfed by almost everything else. No-one is saying that we don’t need to tackle poverty and support people in need at home – we do. But as the 5th richest country in the world, the UK can do both. We have a moral obligation to keep our promises, in bad times as well as good. Find out more about aid at the website of bond, the UK network for organisations working in international development.